Just wanted to let everyone know that my April Short is now posted on the main page of website. Feel free to check it out. Each month I post a short piece on the website for visitors to read. Previous month's can be found on the archives page. This month is murder and vengeance in a short called Jack. I hope you enjoy it. Morning everyone. For anyone trying to read the short story: The Palace of the Gods, posted on my website, I'm sorry about the broken link. It is now fixed so you should be able to click and read with no error message. Woot. Hope you enjoy the story (now that you can actually read it of course). Sorry about not realizing the error sooner. Each month I post a short piece of fiction on the main page of my website. I try to do this around the first of the month (occasionally I am off by a few days depending on when the first falls). Sometimes they are flash fiction pieces and sometimes longer. Either way the current short is always posted on the main page (valeriegaumont.weebly.com) and previous months can be found in the archives. The March Short has now been posted. Enjoy. A new adventure for Cassie Wilson awaits in The Line Between, the third in The Walkers Series. ​After the dawn ritual on her eighteenth birthday, Cassie is welcomed by those of Abraham's pantheon. While she knows she isn't a Walker no one is quite willing to tell her exactly what she is other than 'family'. They are excited about the skills she might develop as her training begins and she realizes that she is the latest entertainment to break up the long monotony of their eternity. As she struggles to maintain her place in the regular world and complete her midterms, the mystical world and her newly developing abilities threaten to intrude. The line between her separate worlds is thin and beginning to blur. How long can Cassie remain a part of both? The latest installment of the Brownie Oxford Series is now available on both Smashwords and Amazon. Check out Brownie Oxford and the Seabridge Surprise. Brownie Oxford, now going by the name Bonnie Brown, is trying her best to avoid notice. She found someone to teach her the skills she needs to control her abilities and people have stopped leaving dead bodies on the lawn in front of her apartment building. Unfortunately, she is surrounded on all sides by Federal Agents trying to confirm she is Brownie Oxford so she once again be an asset. Maintaining her guise as a mild mannered seamstress and student of fashion isn’t easy, especially when the beast supposedly trapped by the Searchers starts visiting and ghosts start making demands. Can Brownie manage to keep this new life she built when even one false step could betray her? ​Available here on both Amazon and smashwords. After surviving an attack by the Brotherhood, Ivy tries to get back to normal life preparing for the launch of Wildwood's retail venture. Unfortunately others have different expectations. The head of the Seers shows up demanding Irina and Nick be turned over to him and Hamilton demands she figure out who else the Brotherhood paid off. Can Ivy figure things out before more attacks occur? Splintered, Book 3 of The Society is now available on both Smashwords and Amazon. Training the Walker, the second in the Cassie Wilson saga is now available. on both Amazon (https://www.amazon.com/dp/B0792K4YYB) and Smashwords (https://www.smashwords.com/books/view/780594). The first in the series was Quickening. Hope you enjoy! All her life Cassie has seen strange things. First it was the strangers with feathers and beaks, then there were the normal looking folks who, when her skin touched hers, sent her vision someplace else. Told always to hide what she saw, Cassie worked hard to fly under the radar. But when more of these strange others came to town, hiding became harder and she was caught. Luckily the ones who caught her seem more interested in training her than killing her, at least for now. She begins her training as one of the mysterious Walkers, but is that really what she is, or is Cassie Wilson something else entirely? 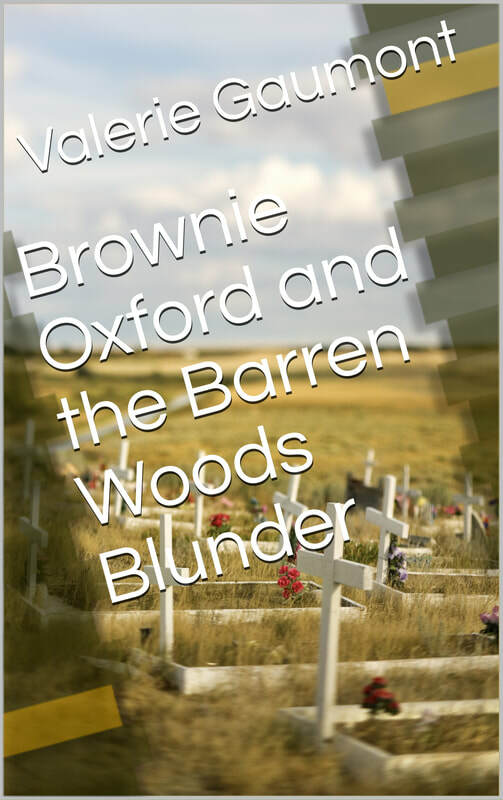 My new novella, Brownie Oxford and the Barren Woods Blunder is now available. It is the third in the Brownie Oxford Series. Check it out! My latest book Free Fall is now available. It is the sequel to Wildwood. Check it out. I know I more or less dropped off the plant for a while. This was, quite frankly, the summer of doom. Death and destruction reigned. And not much else got done. Now of course comes the big move. This Thursday movers come and pack us up. The weekend will be spent in Austin saying good bye to friends and then we begin the 1100 mile drive to the great state of Tennessee. We will be in temporary housing while we look for a place. While I am hoping to get some writing done, realistically I have no idea what my schedule will look like so everything is more or less on hold. Right now it looks like we might be in a new place in January. Once the unpacking is done, normality can resume, or at least my normal. At this point it looks like The Gilded Lily will be out in the spring rather than around Christmas. I will let everyone know schedules once I actually know what's going on. Thanks for your patience.